The euphoria surrounding Sachin Tendulkar’s 200th and final Test had subsided. In the aftermath, the cricketing legend sat alone in a room at Mumbai’s Wankhede Stadium in a reflective mood and asked someone to send Ajinkya Rahane to him. “You may not have noticed, but I have been watching you for a long time. Your attitude, when you are sitting on the bench or serving drinks, has been praiseworthy. Keep up your work ethic and hard work. These have brought you till here; they will take you further ahead,” Tendulkar told Rahane, who was the 12th man in that match against the West Indies. The encouragement could not have come at a more appropriate time for Rahane. After a forgettable Test debut against Australia earlier in 2013, he had lost his place in the playing XI. Sitting on the sidelines was not new for the diminutive Mumbaikar. He has always had to wait for his chances, something that, he says, made him realise the “value of Test cricket”. However, whenever the opportunity came, Rahane clutched on to it, like a middle-class Maharashtrian would to a stable, well-paying job. And his patience has paid off, finally. In the past year or so, Rahane has emerged as one of India’s most successful batsmen across all formats. In fact, since Tendulkar’s retirement, he has been the highest scorer for India in Tests (see chart) with impressive performances overseas, where players from the subcontinent are often found wanting. “He has a very sound technique and temperament. His basics are solid and that has contributed to his success,” says former India captain Dilip Vengsarkar, who has watched Rahane since his under-19 days. Rahane’s journey to the Indian cricket team began unknowingly from Dombivli, a central Mumbai suburb, after residents of his society complained about his habit of breaking window panes while playing with a rubber ball. A more helpful input came from one neighbour, Dr Rajiv Ambade, who suggested to his father Madhukar that he enrol his son for cricket practice. After doing some research, Madhukar zeroed in on the nets conducted by Suresh Khatu at the Dombivli Railway Ground. “The objective was that I’d get some exercise and stay fit instead of wasting time at home. 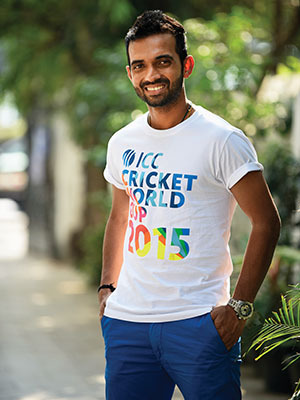 It wasn’t to become a cricketer,” says Rahane, 26. Then aged seven, Rahane was the youngest at the nets but his promise and talent went beyond his age. He faced under-14 and under-16 bowlers without fear even on a matting wicket. Khatu, noting the spark in him, encouraged under-19 bowlers to have a go at the schoolboy. “They initially bowled to him with short run-ups, but Ajju insisted that they bowl properly. He was not even a teenager then, but we knew he was a star in the making,” says Shantanu Kulkarni, captain of the Dronacharya Cricket Club for which Rahane played during his formative years. At that point, cricket was still just a pastime for Rahane. However, the passion was visibly growing. After Khatu showed the seven-year-old a photograph of Tendulkar (one of his two idols, the other being Rahul Dravid) and Vinod Kambli, he went home and told his father, “I will play with them one day.” Rahane smiles as he recalls this. “I only told my father about it. Nobody else,” he says. As providence would have it, he batted alongside Tendulkar in his first Test against Australia in 2013. The infrastructure in Dombivli was not ideal for playing cricket and Rahane’s school, Tilak Nagar Vidyamandir, did not play inter-school matches either. That’s when his father recommended that he move to SV Joshi High School, which participated in the Giles and Harris Shield tournaments. That move proved critical in shaping Rahane, the cricketer. “He had all the qualities of a good player and was extremely fit for his age (Rahane is a black belt in karate). We played in tough conditions, but he did not miss practice ever,” Rahul Chordekar, Rahane’s schoolmate at SV Joshi, says. His commitment to the game was such that with a heavy kit, he would board the 5 am local from Dombivli to play matches at Shivaji Park or Azad Maidan in South Mumbai and return only at night in crowded trains. His reputation grew run by run. After he was selected for the Mumbai Ranji team in 2007, he scored 143 against Karachi Urban on debut. In first-class cricket, he scored more than 1,000 runs in three seasons at an average of over 60. If figures could tell a story, his were screaming it aloud. Yet, the call to the Indian team eluded him. A robust middle-order comprising Tendulkar, Dravid and VVS Laxman made it even tougher to get a foot in. “There is a time for everything. My only aim was to give my 100 percent. I knew that the other things would take care of themselves. Also, if you get things late, their value stays with you for long. I believe that if you take care of the game, the game will take care of you,” Rahane tells Forbes India on the eve of the team’s departure to Australia. He says the four years—between his Ranji debut and national duty—taught him to prepare his mindset during adverse moments. “How you behave during testing times defines you and shapes you as a person,” he says. His coaches cited Michael Hussey’s example to motivate him. The Australian had to accumulate over 10,000 runs in domestic cricket before he was drafted into the Test team at the age of 30. Luckily for Rahane, he did not have to wait that long. The call came during the home series against West Indies in 2011, but he ended up warming the bench for two years and 16 Test matches. The wait to play Tests for India continued. Former India player and Rahane’s mentor-coach Pravin Amre echoes his views. “He showed great attitude and enjoyed the success of his colleagues.” Rahane credits his family and friends for keeping him grounded. “I could have easily slipped into depression. A sportsman’s life appears easy, but there are many upheavals… hence, their support was very crucial,” he says. Wasim Jaffer, who has enjoyed many partnerships with Rahane for Mumbai and Indian Oil, says his ability to conquer tough periods is commendable. “Being on the bench for two years can be extremely frustrating. But Rahane is always up for a fight. When the going gets tough, he wants to hang around and be there,” says the former India opener. An injury to Shikhar Dhawan resulted in Rahane making his debut in the fourth Test against Australia in Delhi in March 2013. But two single-digit scores in the game prompted many to question his ability to handle pressure and replicate his domestic success at the international level. It was yet another testing period for the young cricketer. The turnaround took place through the Indian Premier League (IPL), the same vehicle that had brought him into prominence and earned him a call to the national team. His initial foray into the IPL was with the Mumbai Indians for a couple of years, but given its star-studded lineup, he rarely got a chance to play. “Perhaps that was not my time,” Rahane says. And then, he caught the eye of Rajasthan Royals’ Shane Watson, who had watched him score an 80-ball hundred in a session in the second innings of a three-day game against Australia A in 2010. Having bought him from the Mumbai Indians, Dravid and Watson got Rahane to open the innings. “Opening the batting with Rahul bhai gave me a chance to express myself and showcase all that I had learnt over the years,” says Rahane. Similarly, post the Australian tour disappointment in 2013, Rahane’s brisk scoring, big hitting and textbook shots in the IPL made it impossible for the national selectors to keep him out. And, this time, his IPL form carried forward to the bigger arena. Rahane’s fairytale run began late last year when he scored 51 not out and 96 against South Africa in the Durban Test match, with the likes of Dale Steyn repeatedly aiming at his body. A couple of months later, he notched his first Test century against New Zealand in Wellington after coming in to bat with the team precariously positioned at 165 for five. “I was relieved. I realised the importance of those 3-4 runs when I hit a boundary on 97. While the thought of a hundred crossed my mind when I was batting in the 90s in Durban, I did not even think about it at Wellington,” he says. Another innings that he is unlikely to forget is his match-winning century against England on a green top at Lords in July 2014. Vengsarkar describes it as one of the finest innings he has seen by an Indian batsman. Rahane was the only batsman who put up a fight with the team tottering at 145 for 7. He then led the counter-attack and, along with Bhuvneshwar Kumar, added 90 runs for the eighth wicket to set up an Indian victory. “When Bhuvi came in to bat, I told him that I’ll take my chances. We (the team) scored 150-odd runs in 20 overs and the match turned in our favour,” recalls Rahane. On a tour where the likes of Virat Kohli and Cheteshwar Pujara struggled, Rahane looked impregnable and invited praise from several cricketing greats. His name now features on the prestigious honours board at Lord’s, something that even Tendulkar and Sunil Gavaskar cannot boast of. Rahane, though, isn’t getting carried away. “Every hundred is special,” he says. He followed the Lord’s century with his maiden ODI hundred and had another three-figure knock in the one-day series against Sri Lanka at home. 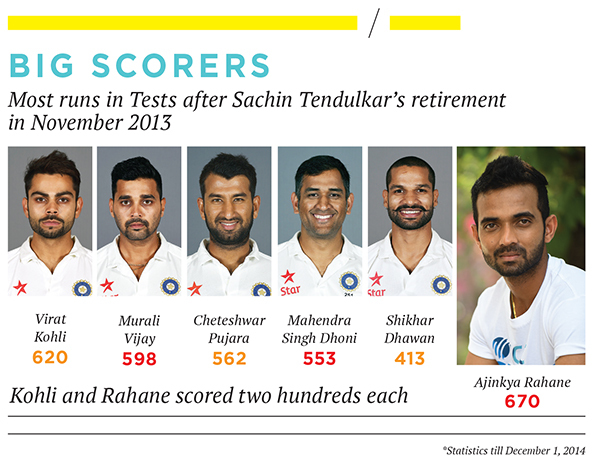 Despite his ever-improving career graph, Rahane has his feet firmly on the ground. Though he can now afford a house anywhere, he preferred to move to the central suburb of Mulund and stay with his parents. His father, who was an engineer with BEST, has been his pillar of support while his mother, Sujata, a homemaker, made many sacrifices to ensure that her eldest son (Ajinkya has a younger sister and brother) could live his dream. Also, though he is aware that a sportsman’s shelf life is short, Rahane has resisted the temptation of earning fast money by doing endorsements. “He has told me that he only wants to focus on his game for the time being. Besides, he is against endorsing alcohol or tobacco products. While many cricketers merely say cricket is their first love, he means it,” says Atul Srivastava, founder of Gaames Unlimited and Rahane’s manager. Rahane is also conscious of his failure to convert his starts on many occasions. “Nobody likes to get out, but yes, I am working on that,” he says. Polite and decent to a fault, Rahane remains unaffected even if the spotlight is on his more flamboyant teammates. That was evident during his interaction with Forbes India. Not even once did he give the impression that he is one of the emerging stars of Indian cricket. However, people who know him closely say the image of a shy and reserved Rahane, who loves listening to music and watching movies, is only half the truth. Much like his hero Tendulkar, he too is a prankster and a good actor. Right through the tour of England, for instance, he assumed a British accent much to the amusement of everyone. Perhaps Rahane can afford to let loose some more. Because the agonising wait seems to be over. It is time to revel in the limelight.